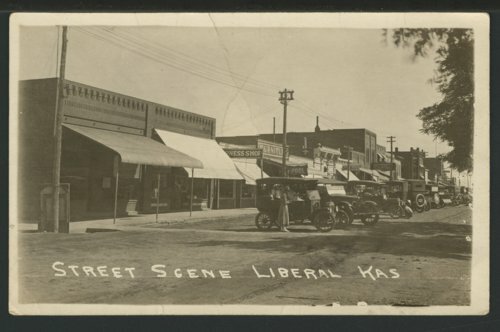 This is a street scene showing the business district in Liberal, Kansas, with a row of automobiles parked in the center of the street. Two of the businesses visible are the Liberal Harness Shop and the Economy Dry Good Millinery Shop. The postcard was sent to Mr. Elmer Gayen in Pratt, Kansas.